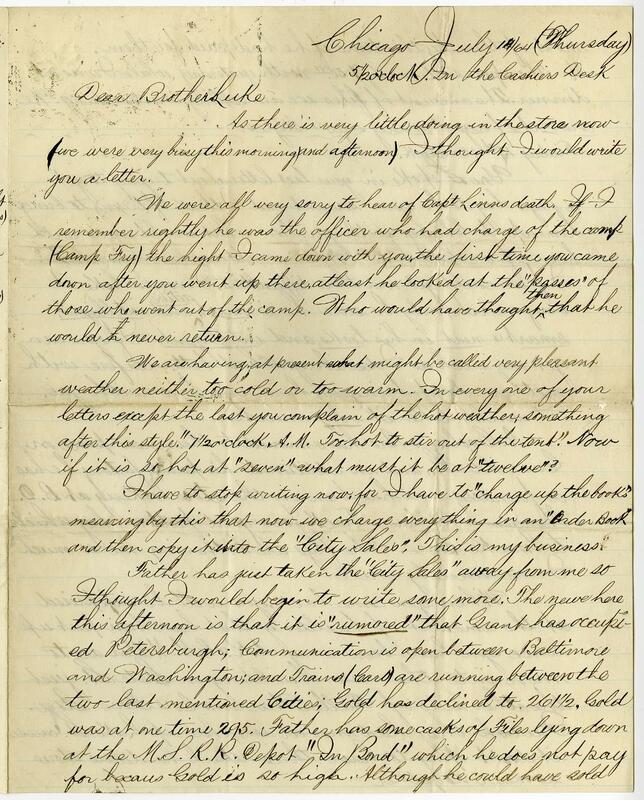 Item description: Letter, dated 14 July 1864, from William Hunt to his brother Andrew Lucas Hunt. Andrew Lucas Hunt (1843-1905) of Chicago, Ill., was an officer with the 134th Illinois Regiment, United States Army, during the Civil War. 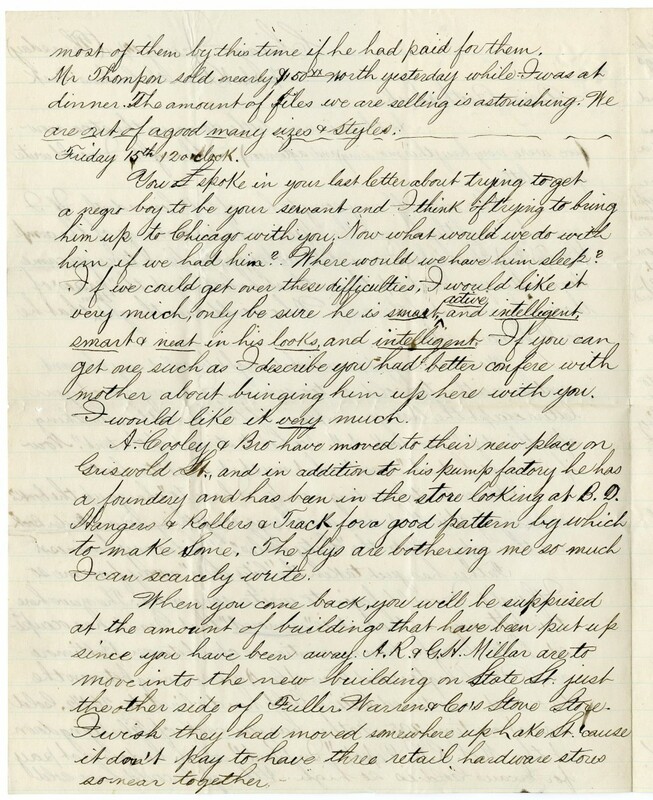 Item citation: Letter dated 10 July 1864, in the Andrew Lucas Hunt Papers, #3225, Southern Historical Collection, The Wilson Library, University of North Carolina at Chapel Hill. As there is very little doing in the store now (we were very busy this morning and afternoon). I thought I would write you a letter. We were all very sorry to hear of Capt. Linn’s death. if I remember rightly he was the officer who had charge of the camp (Camp Fry) the night I came down with you, the first time you came down after you went up there, at least he looked at the “passes” of those who went out of the camp. Who would have thought then that he would never return. We are having at present what might be called very pleasant weather neither too cold or too warm. In every one of your letters except the last you complain of the hot weather, something after this style. “7 1/2 o’clock A.M. Too hot to stir out of the tent.” Now if it is so hot at “seven” what must it be at “twelve”? I have to stop writing now, for I have to “charge up the books” and then copy it into the “City Sales.” This is my business. I thought I would begin to write some more. The news here this afternoon is that it is “rumored” that Grant has occupied Petersburgh; Communication is open between Baltimore and Washington; and Trains (Cars) are running between the two last mentioned Cities; Gold has declined to 261/2, Gold was at one time 2.95. Father has some casks of Files lying down at the N.S.R.R. Depot “In Bond” which he does not pay for becaus gold is so high. Although he could have sold most of them by this time if he had paid for them. Mr. Thompson sold nearly $50xx worth yesterday while I was at dinner. The amount of files we are selling is astonishing. We are out of a good many sizes & styles. This entry was posted in Southern Historical Collection and tagged 134th Illinois Infantry Regiment, Andrew Lucas Hunt, business, Chicago, hardware, home front, Illinois, William Hunt. Bookmark the permalink.